Schaeffer & Long has been restoring antique and classic cars for over 41 years in the same location. We have 3 generations with countless years of experience. With painting, machine shop service, mechanical, upholstery, engine building and wood working done on site. We are the premier restorers on the east coast, with a worldwide reputation. We began in 1966 restoring antique cars the old fashioned way using original methods and materials where possible. We pride ourselves on turning out the highest quality product possible. Our rates are reasonable. We take jobs both large and small. This allows both part time and full time restorations. Our paint shop is one of the finest. 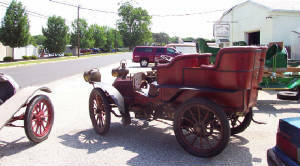 Our mechanic's understand old motors as far back as 1900. We custom fabricate in wood, steel, aluminum, brass and copper. Our machine shop is also worth noting. This combination of skills makes Schaeffer & Long a true full service facility. Please stop in and discuss your project or ideas.